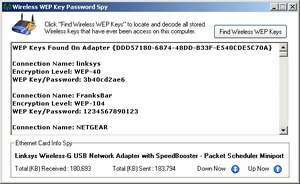 Wireless WEP Key Password spy is a password recovery utility as opposed to a 'password cracker'. The main function of this application is to retrieve network passwords which have been saved by Windows to the system registry. To get started with this WEP password finder, simply open the application, click on the "Find Wireless WEP Keys" button and you'll then be shown some details about the wireless keys it finds in the registry. They consist of the wireless network name (SSID), the type of encryption the network is using (such as WPA-PSK, WEP 104, WEP 40, and so on) and the actual WEP key which is used to connect to the WiFi network. WEP Key Password Spy 1.0 is a shareware program and can be used as a demo to try the software until the free trial period has ended. A full version of the program is available after the trial period ends. For security reasons, you should also check out the WEP Key Password Spy download at LO4D.com which includes virus and malware tests. Additional screenshots of this application download may be available, too. WEP Key Password Spy has a presence on social networks.